Cheers Grace for making the illiterate infant a featured blogger! Hi to anyone who is popping in from withsomegrace.com where the illiterate infant is this weeks featured blogger! If you’d like to read some of my older posts check out the archives What you have missed and All the rest.. on the right hand side. Comments, Facebook and Twitter followers are most welcome and appreciated. 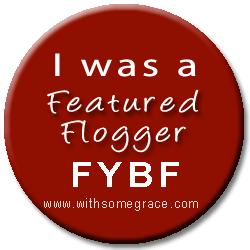 9 Responses to Cheers Grace for making the illiterate infant a featured blogger! I’m not sure “dad flogger” is something I will be googling at work! absolutely! and thanksfor popping by. A very deserved featured flogger indeed. But I think you are right, I will definitely shy away from googling dad flogger. I made the mistake of googling dry-feeding, in relation to breastfeeding, the other day after hearing the term and wanting to know more, and after finding the usual article or two from parenting websites I discovered a whole new meaning to the term dry-feeding and I’m feeling a little google shy at the moment! I think my cheeks might still be a little flushed and I don’t get flushed easily! popping in from fybf! congrats! Thanks so much for doing an awesome job at FYBF, Kev!!! Hope you had fun 🙂 Feel free to grab the “Button of Honour” and paste it on your sidebar. I’ll get the button on there tonight. Thanks so much for the opportunity!